Water turbines are used to convert the energy of falling water into mechanical energy. Axial flow turbine: In this turbine, flow is parallel to the axis of rotation of the runner. ex: Propeller and kaplan turbines. Tangential flow turbine: In this, flow is tangential to the path of rotation of the runner. Ex: Pelton turbine. Radial flow turbine: In this flow, is in radial direction. Flow remains in the plane normal to the axis of rotation of the runner. 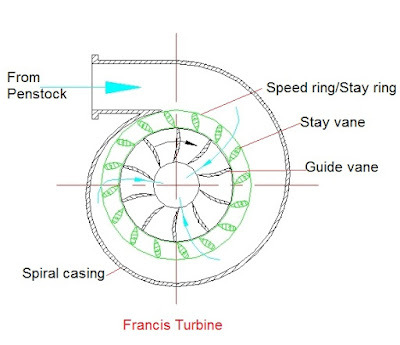 Ex: Francis turbine. Mixed flow turbine: In this flow, water enters the runner at the outer periphery in the radial direction and leaves it at the centre in axial direction. Ex: Modern francis turbine. 1. Impulse turbine: In this turbine, all the available energy of water is converted into kinetic energy or velocity head by passing through a nozzle provided at the end of penstock. 2. Reaction turbine: In this turbine, all the available energy of water remains mostly as pressure energy. As the water flows through the runner, the pressure energy gradually decreases. Therefore, the runner must be enclosed in an air tight casing. Ex: Francis, Propeller, Kaplan turbines. It is defined as hypothetical speed of the turbine at which it produces 1 H.P of power under head of 1 meter. It is an important parameter in the design of turbines. Where N is the Actual rotation speed in rpm. It depends on head, specific speed, efficiency, part load operation. 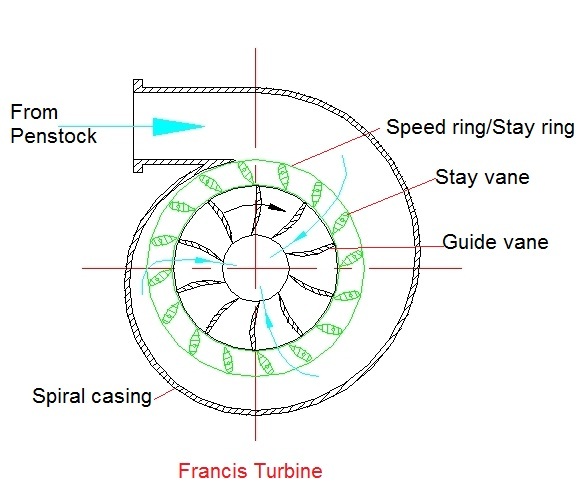 Parts of a francis turbine is described below. Spiral casing: The purpose of the casing is to provide an even distribution of water around the circumference of the turbine runner. The cross-sectional area of the casing is gradually decreased to keep the velocity of water constant throughout its path. Speed ring or Stay ring: The purpose of ring is to direct the water from the spiral casing to the guide vanes or wicket gates. Guide vanes or Wicket gates: The function is to regulate the quantity of the water supplied to the runner and to direct water on to the runner at an angle appropriate to the design. The guide vanes are operated by a governor. Runner: It consists of a series of curved vanes around the circumference to change the direction of flow of water when it passes through the runner. The runner is keyed to a shaft. Draft tube: It is a pipe or passage of gradually increasing cross-sectional area which connects the runner exit to the tail race. The lower end must be submerged below the level of water in the tail race. It permits a negative or suction head to be established at the runner exit, thus making it possible to install the turbine above the tail race level without loss of head. It converts a large proportion of velocity energy rejected from the runner into useful pressure energy i.e, it acts as a recuperative of pressure energy. The operation of regulation of speed of turbine runner is known as Governing of turbine. It is done automatically by means of Governor. Runaway speed: This is the maximum speed at which a turbine wheel would run under the worst conditions of operation with all gates open so as to allow all possible water inflow under maximum head.